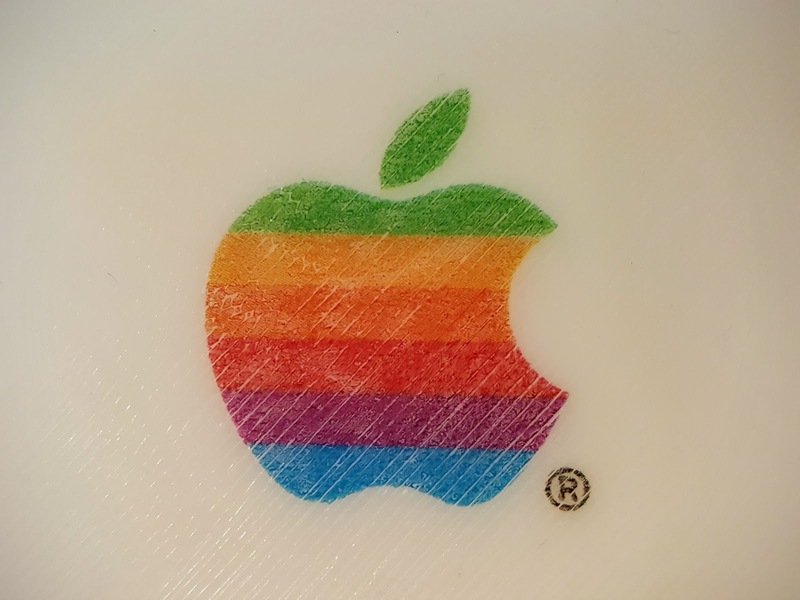 I recently saw an article about using acetone to transfer toner from a laser printed page onto things. 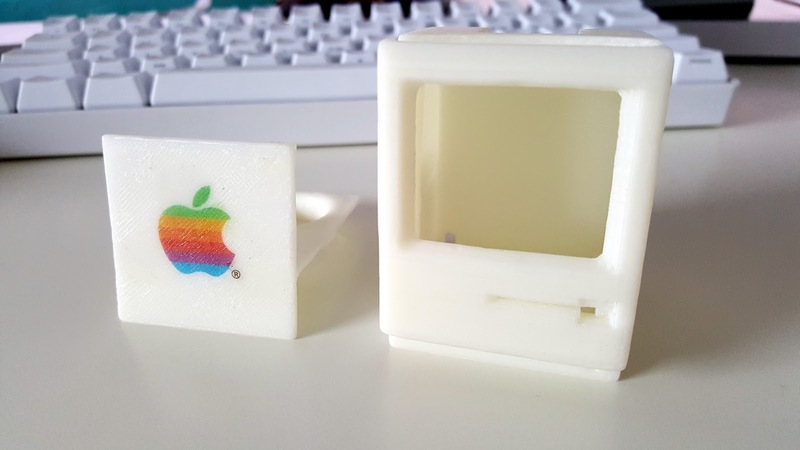 I did a little more reading about this and thought it'd be a nice experiment to try to add graphics to a 3D printed object. 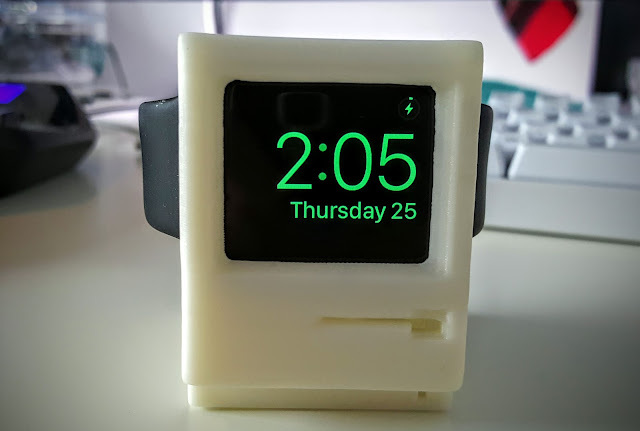 There's a nice model on Thingiverse of a charging dock for an Apple watch in the shape of an old Macintosh that I thought was cute. I printed it out and wanted to add some graphics to personalise it as a gift for my brother. 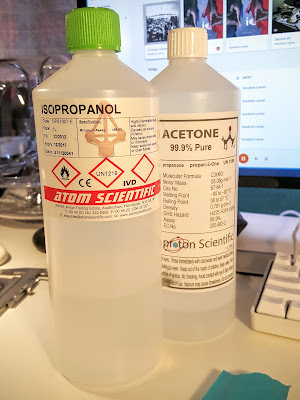 From the articles I read I reckon there are two viable methods to transfer the toner that I'd try out; heat and chemical. First of all I needed a test image for my experiments. The Apple "rainbow" logo would be good for this, I needed to print it mirrored on the page for it to look correct when transferred to the object. 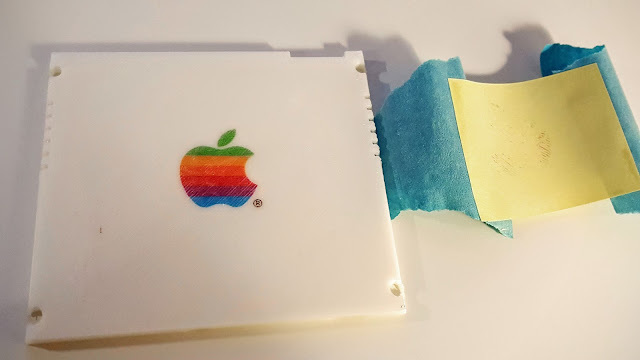 In the past I've used the "toner transfer" method for home-made PCBs. 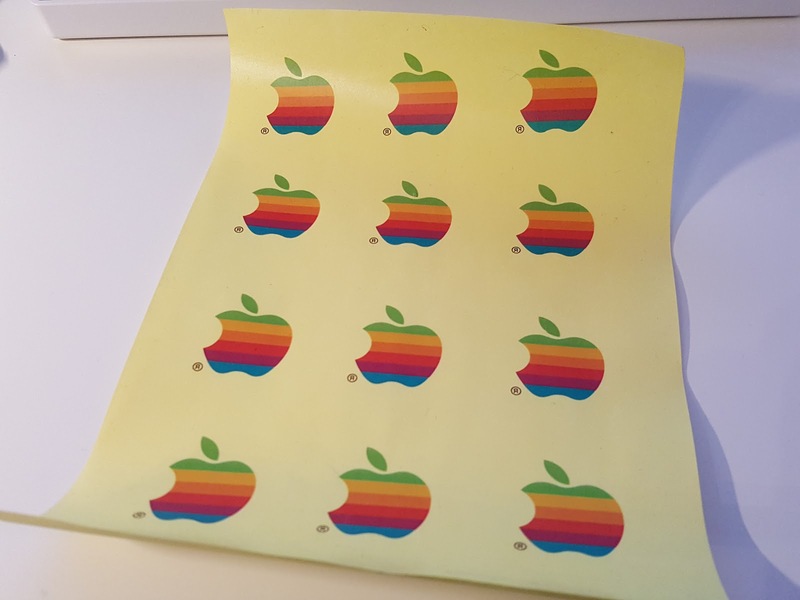 I picked up some special transfer paper from eBay for cheap, this paper worked well for heat-based PCB transfers, so I'd use it again here. 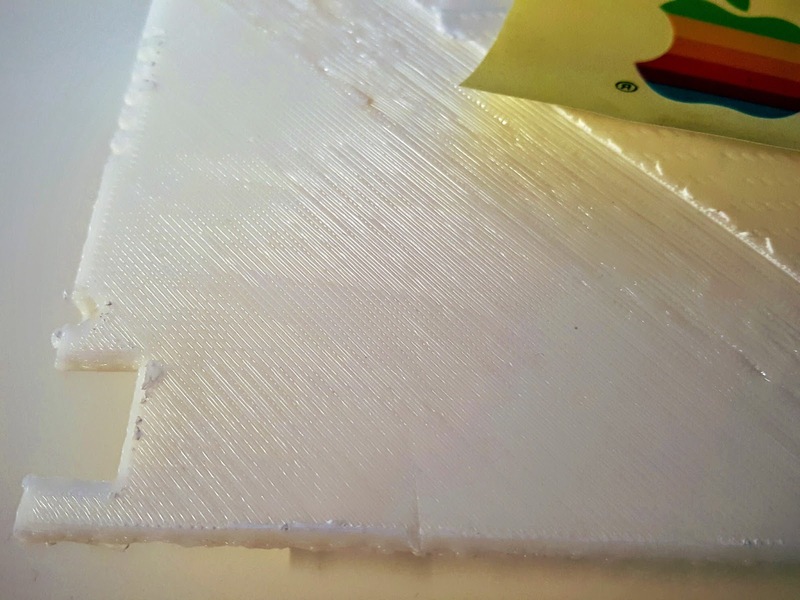 The surface of the 3D print would affect the adhesion of the toner I thought. 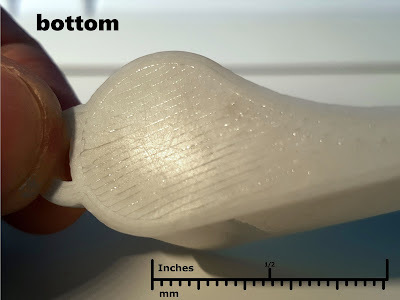 It'd be easiest to get the image to stick on a flat surface and there're three different flat surfaces on your 3D prints; the bottom, sides and top. 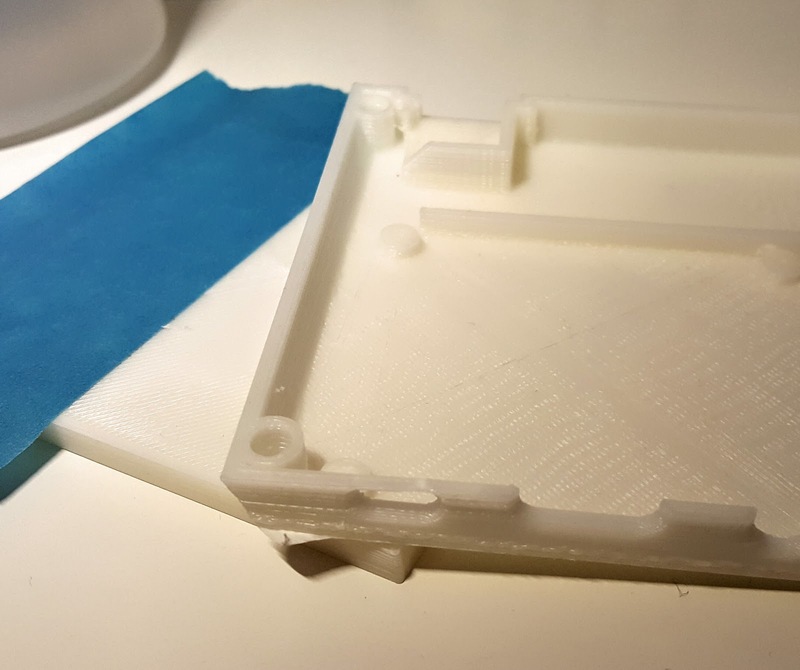 The bottom surface of the print will be smoothest, in my case I print ABS straight onto glass, so the flat bottom of my prints come out quite smooth and flat. 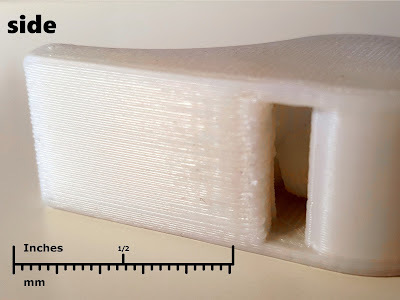 The sides of a print made on an FDM-type machine will have the ridges typical of this type of 3D printing and are fairly rough. 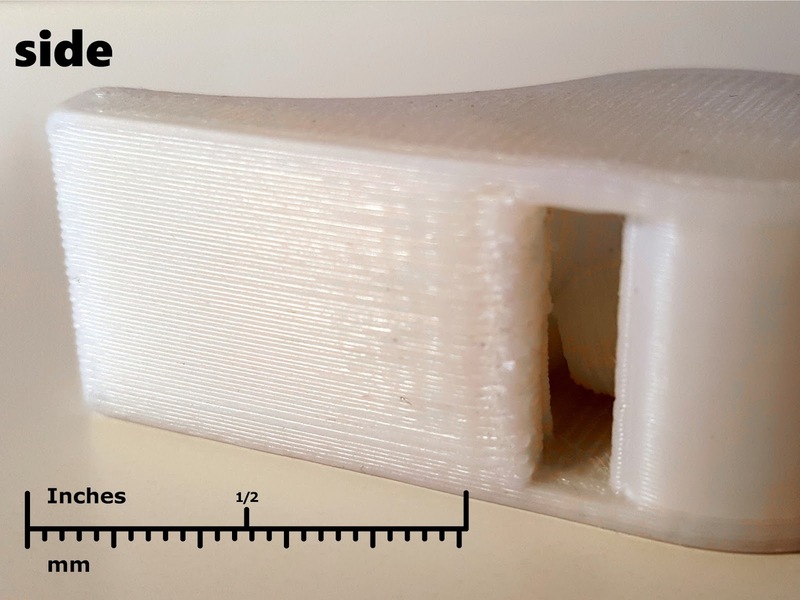 How so depends on the z-resolution of the print (0.2mm in this case). The top of a print, in my experience is the roughest of all three. Roughness depends on the size/quality of the nozzle. I have a cheap 0.4mm nozzle on my printer, and that gives a fairly rough surface finish compared to the other sides. Like many people with a 3D printing hobby, I have a bunch of prints that failed or were otherwise not used. Some got melted down to make ABS juice but I do have a few scrap pieces to donate to this experiment. At the moment I like printing in ABS for it's higher melting point and better flexibility than PLA. ABS also readily dissolves in acetone, this makes it easy to bond parts extremely firmly by chemically 'welding' two surfaces together. 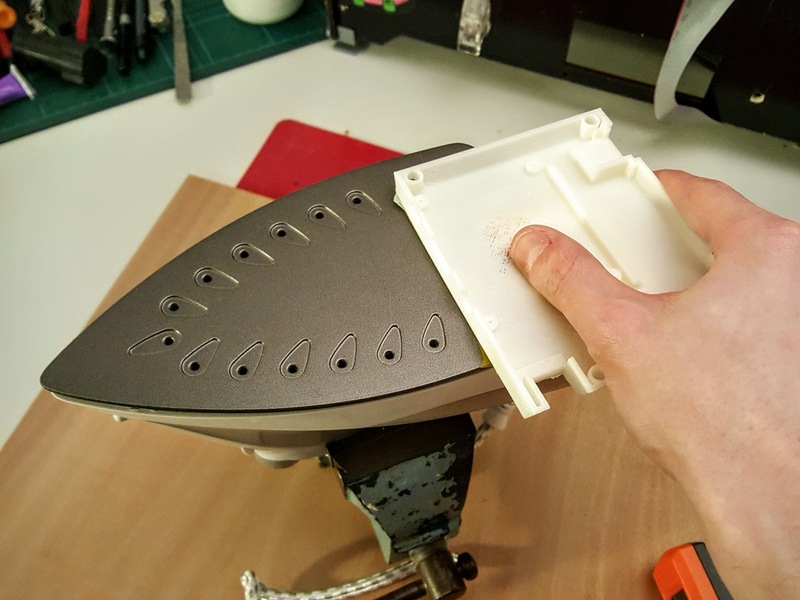 PLA isn't soluble in anything easily available, so you can't do the same sort of post-processing that you can with acetone and ABS unless you use more exotic, nastier chemicals. Printer toner is made up of similar material to ABS and the article relies on dissolving the toner with acetone to release it from the paper. Rubbing acetone all over an ABS print might warp it, and would definitely affect the surface finish so I'd have to try something else. 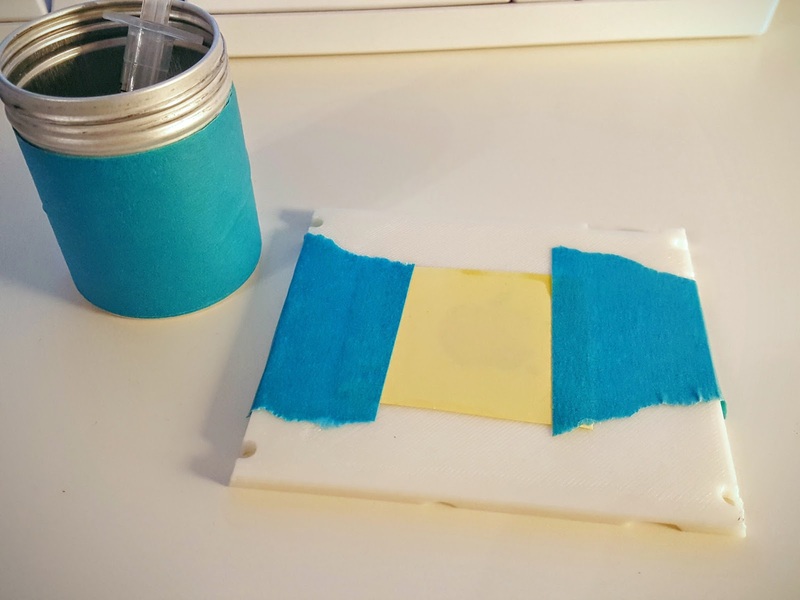 This instuctable uses a mixture of alcohol and acetone to soften but not fully dissolve the toner that allows it to transfer onto the copper-clad board for PCB etching. 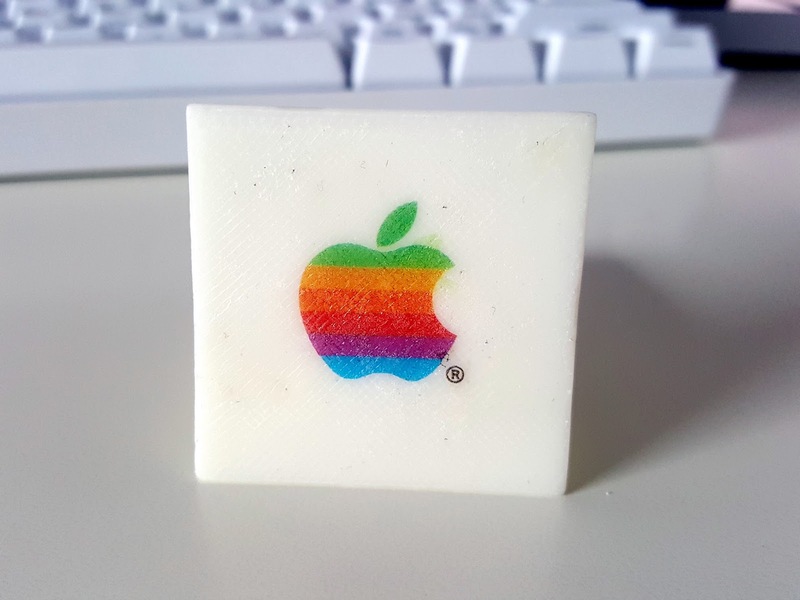 Since ABS plastic and laser toner are similar materials it might work on my 3D prints... only one way to find out. The mixture is 8 parts Isopropanol(Isopropyl alcohol) to 3 parts Acetone, I have both of those already and they're really common and useful chemicals to have around when you're 3D printing as a hobby. I placed a couple of drops of the mixture on the surface of the part and laid the image down lightly pressing the back. After about letting the toner soften up for 10 seconds, I applied firm, even pressure on the paper whilst being careful not to slip and smear the image. Disaster. This was my attempt on the top surface of a printed part. You can see where the image only stuck to the tops of the ridges and the rest was left behind on the paper, D'oh. Next I tried on the smooth bottom-side of a print, this time taping the paper down after adding the liquid to the plastic surface. A much better result. The colours are nice and vibrant and almost all of the toner got transferred to the plastic, I was surprised how well it turned out. Up close you can see where the toner stuck nicely to the flat plastic and where it didn't stick to the tiny gaps between layers. Using the 8:3 mixture of alcohol to acetone gave me nice results on the smooth print. The rough sides were much harder to get a clean transfer. The tiny ridges meant there were parts of the graphic where toner wasn't in contact with the plastic and the image didn't transfer properly. Applying more pressure wasn't easy because you risk it smearing. Adjusting the ratio of acetone in the mixture might yield better results but a better solution would be to lightly sand the rough parts to remove the ridges and give a nice, flat surface for the toner to stick to. Chemical method on smooth ABS surface = success. In "traditional" toner-transfer, heat is used to release the toner from the paper. 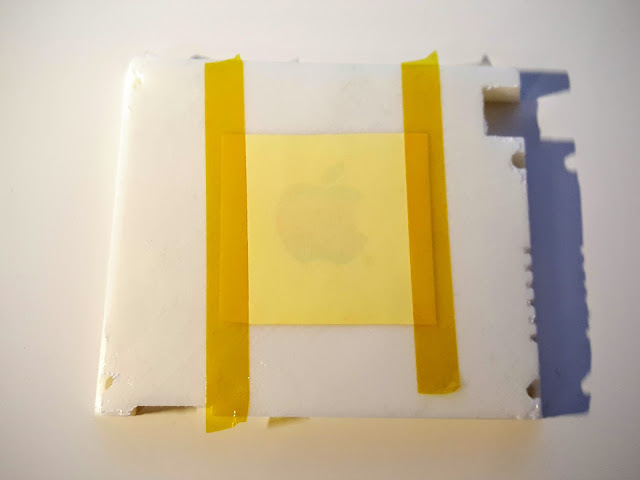 I've used a modified laminator to make PCBs in the past and that worked well. Obviously I can't send a 3D print through a laminator so I'm going to try another venerable method to apply the heat... a clothes iron. While the chemical method might work better on acetone-immune PLA, heat will definitely work better with the higher melting-point ABS. First try with heat on the top surface of a print, paper taped down ready for the iron. The iron was set to its highest temperature and measured ~220°C(430°F) on the surface. I held the print down for about 5 seconds, pressing down firmly. 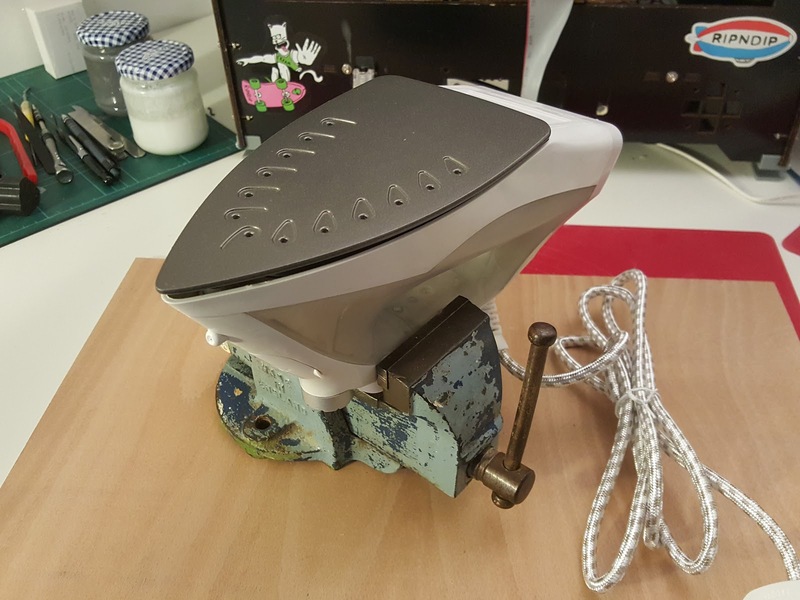 This would hopefully give enough time for the toner to let go of the paper without heating up the part too much. Not a perfect result, but quite a bit better than the chemical method. You can see how a lot of the toner is still left on the paper though. The pattern of the ridges are clearly visible. You might get improved transfers with longer on the heat, but as before, I suspect a smooth surface will garner the best results. 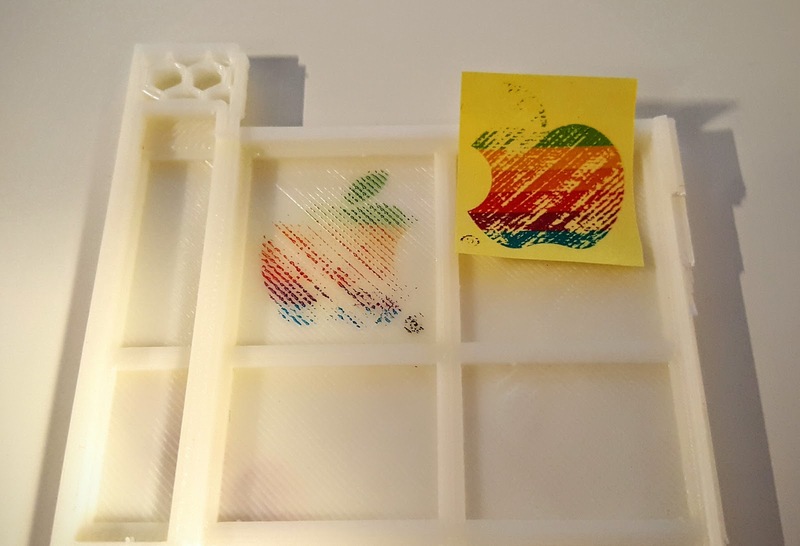 Heat test #2: the smooth bottom of an ABS print with the graphic taped-up. This time I got a great image. Only a very small amount of toner is left on the paper and the colours of the transferred logo are vibrant and well defined. Close-up it might even be better than the chemical method, maybe not as crisp but a little better coverage between the layers although that might be variance between the printed parts. Heat method on smooth ABS surface = great success. 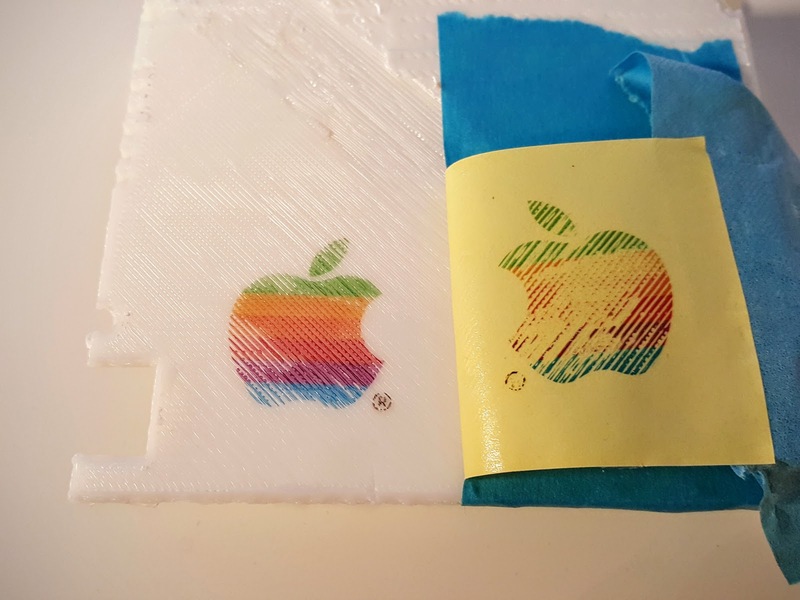 In conclusion then, applying graphics to 3D printed parts using toner-transfer is very viable, as long as the surface of the part is smooth. There's definitely scope for more experiments here. I need to try toner transfer with PLA prints and could improve the method to get better adhesion on rough prints. Overall I'm pleased with the outcome, and will definitely brighten up my future prints with some graphics. does it have to be laserjet what about inkjet? 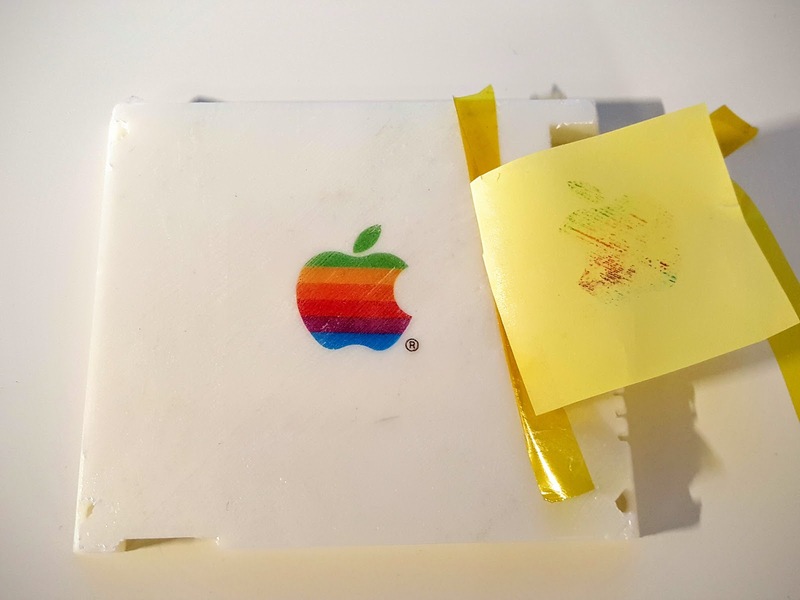 This method only works with laser toner afaik. 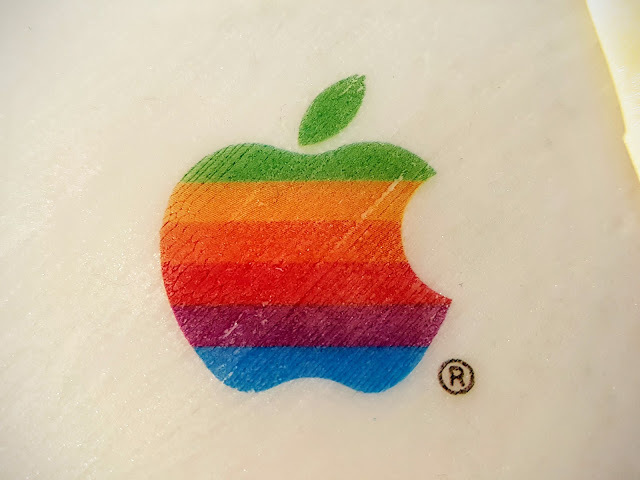 is this what you did for the logos on the mini nes? 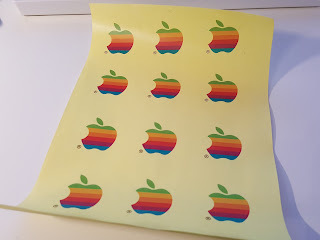 Yes, although I also tried waterslide decal paper with mixed results. Hi Mike, great work and awesome explaining. Where did you get the image to transfer the NES labels? Did you get the font or were able to find images?